Boots was established by John Boot in 1849 in Nottingham. Nottingham is still the UK home of Boots although the company is now owned by the American pharmacy chain Walgreens. Boots offers pharmacy services and a huge range of gifts in many of its stores including fragrances and colognes from Diesel, Armani and Marc Jacobs and make-up from leading brands including Maybelline, Benefit and Smashbox plus Boots’ own No. 7 brand. The Boots Gift Card is therefore a popular choice as there’s so much variation in the products that can be bought with it. How can I check the balance of a Boots gift card online? Currently, Boots don’t have the facility to check gift card balances online. If this changes we will of course update this page as soon as we can. You can call Boots on 0345 120 5677 to request a giftcard balance over the phone. Please be aware that this is not an automated service and is only open during office hours. Telephone calls are charged at your standard network rate, so if you have “free”/”inclusive” minutes, this call will be included. This telephone number is operated by Boots. 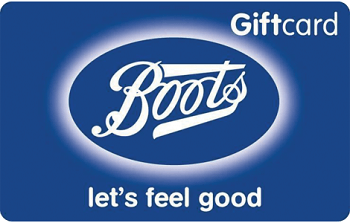 You can find the current balance of a Boots gift card by presenting the card(s) at any Boots or Boots Opticians store. Due to the restrictions of the Boots gift card, have you thought of giving a Dorothy Perkins gift card or Superdrug gift card instead? Where can I buy a Boots gift card? You can buy a Boots giftcard from any of their UK stores. Click here to find your nearest Boots store. Boots gift cards are also sold at branches of Morrisons supermarket. Boots don’t sell their giftcards online themselves, however £10 and £20 gift cards are available from The Gift Card Centre, with postage from £1.95. Where can I spend my Boots giftcard? Anything else I should know about Boots giftcards? Your Boots giftcard will expire 24 months after the last use. If your Boots giftcard expires, you will lose the value on the card. You can top-up a Boots gift card at any Boots till so you could make a top-up if your card is about to expire but you’re not ready to spend it yet. Please provide a facility to check gift card balances online. Its all very well saying we can go in store or contact the number but most staff instores treat this as an inconvenience. very poor service -we should be able to check our card balance online. I wished I had read the above comment before I bought the gift card. Certainly this will be the last time. Come on Boots, pull your boots up & move with the times .